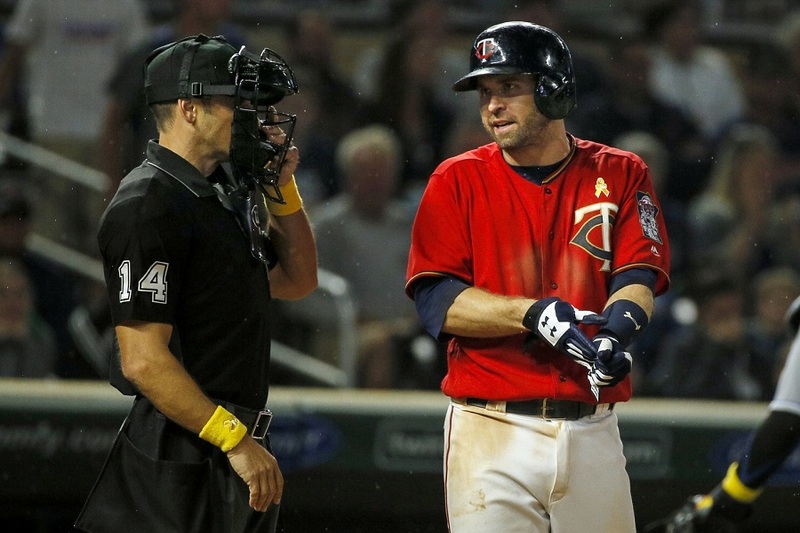 Brian Dozier has clearly become a team leader for the Twins over the last handful of years. His future with the club is up in the air as his contract is set to expire at season’s end. Pitchers and catchers will soon report to Fort Myers and it seems like the Twins are content with letting Dozier play this season without an extension. Besides an extension, other debates involving Dozier have surfaced over the last couple of weeks. Let’s look at some of the conversations surrounding Dozier. There have been plenty of posts here at Twins Daily wondering which players would make sense to lock up with an extension. It might make sense for some young players before they reach arbitration or more veteran players like Dozier and Joe Mauer who will hit free agency at the end of 2018. It doesn’t sound like the Twins have approached Dozier about staying in Minnesota. “There have been none whatsoever, zero conversations about [staying in Minnesota] after next year,” he told Sid Hartman of the Minneapolis Star Tribune. This doesn’t mean something can’t be worked out but the beginning of spring training is quickly approaching. It seems likely that the two sides won’t be talking during the regular season. Houston used a combination of veterans and youth to win the 2017 World Series. Minnesota is going to need to build a similar roster if they hope to make headway in the American League. I was on Bison 1660 in Fargo at the end of last week and we discussed Dozier’s future with the club. Over the last couple weeks, word came out that the Players’ Union rejected MLB’s pace of play proposals. These new rules could include a pitch clock and fewer trips to the mound. A pitch clock has been used at the Double-A and Triple-A level since 2015. Since MLB introduced these ideas before last season, the Commissioner could implement the changes without the approval of the Players’ Union. Dozier was part of a two-hour conference call with player representatives from all 30 teams. His message coming out of that call was that the players are united in their opposition to these proposals. Dozier went on to suggest that it is up to the more veteran players to make the younger players speed up their game. While this might sound like a good suggestion, players knew these rule changes were possibly coming this season and nothing changed in 2017. In fact, nine-inning games were actually longer last season than in 2016. What are your thoughts on the Dozier debates? Should the team extend him? Do you agree with him about the pace of play proposals? Leave a COMMENT and start the discussion. The Twins are an organization rich in middle infilled depth, and they better spend the $ that would take to extend Dozier towards pitching or towards extending some of their younger players. They should trade him, or give him a qualifying offer. There's no clock in baseball. No clock. I don't give a @$% what they've done in the minors since 2015 or 1883. There's No. Effing. Clock. Dozier? By all means, extend. Guys in the minors are prospects, not proven talents, no matter where they're ranked by Baseball America. Unless there's someone in AAA hitting 40 dingers with (questionable) Gold Glove defense, then cutting Dozier loose would be idiotic. I am for a Dozier extention. I'm open to trying a few things to speed up the game, though I'm not 100% sure game clocks are the answer.I think a big reason for the longer games is managers are going to their bullpens earlier and more often then they ever have.There isn't much you can do to change that. I would definitely prefer to see the games start a little earlier. Oh and yes on a Dozier extension.It doesn't matter how many middle infielders the team has in the upper minors, exactly zero of them have shown they can cut it in the majors.Dozier is a power hitting, gold glove winning all-star 2nd basemen.Keep Dozier and the cannoli, trade the rookies and the gun. The front office has made it clear it would like to explore extensions with its young core of players, such as Byron Buxton, Miguel Sano, Jose Berrios and Max Kepler. Jorge Polanco and Eddie Rosario are also candidates, while veterans such as Brian Dozier and Joe Mauer are in the final years of their contracts. The Twins, though, aren't going to focus on potential extensions until Spring Training, once they turn their focus away from free agency. I've read/heard this many other places as well. While it is possible that they may not try that hard to extend Dozier, claiming (as this article does) that they seem to have no intention of bringing Dozier back because they haven't discussed an extension with him yet, when they have explicitly said they will discuss extensions later is . . . strange at best, and blatently misleading at worst. This is how mid-market teams need to operate. It will sting to lose Dozier but that's a risk you need to take to keep payroll manageable and shore up other positions of need. Hopefully, Gordon posts another .750 OPS season and gets a late-season taste of MLB pitching. Then you're in a pretty good position to run Polanco/Gordon in the middle infield in 2019. But the Twins might keep Dozier. I don't know where I'd put the threshold to offer/decline a QO but it's probably in the .775 OPS range. I'd pay Dozier a lot of money to put up middling performance (hoping for a rebound) if he slides in 2018. Of course, that OPS number needs to be higher if Gordon goes nuts in Rochester and posts an .800+ OPS. If Gordon looks good/great, then you need to be confident Dozier will decline the QO. Overall, the Twins are in a pretty strong position here and I'm not worried about it. It would be nice to know what our mindset on salaries are for the future.I think the Twins should spend a minimum of $130M (obviously there can be exceptions).There is also reason to believe that this organization can afford $140-150M.IF, we are going to spend $130M, I think it is a solid plan to hold the payroll slot for a top flight pitcher, like Darvish,should one come available.If we are willing to go up to $150M, we can sign Dozier too.With Mauer coming off the books in '19, and then Hughes you will have room to sign some of your up and coming talent. My opinion can’t be formed without qualifiers in years and dollars. 5 years and $100M? Hard pass, thanks Mr. Dozier, don’t let the door hit you on the way out. 4 years and $60M? Welcome aboard. With pace of play, it has to be asked—if baseball is struggling to attract younger fans due to the length of the games, it’s going to have a tough time remaining relevant in the next 50-100 years. Therefore, the question is whether something should be changed to save it, or preserved to lose it. The problem with extending Dozier is you almost have to then trade some MI talent. And they haven't shown any indication of trading anything so far. If you can't count on one or two of their MI prospects making the jump soon, there is no sense in having a scouting or analytical dept. Tat said, I would not extend Dozier, and since it's too late to effectively trade him I would let it play out. I highly doubt I would then keep him. In a perfect world I would use that money on pitching. Actually, there are pitch times specified in the rule book that player and umpire routines conformed to for all of Major League baseball history up until very recently (last 20 years?). I am not sure why some people consider the last 20 years of MLB to be more "real baseball" than the previous ~125 of MLB, or all ~145 of all other levels of baseball (which is simply what the pitch clock would train modern MLB player and umpire routines to follow). Another way to put the above: "There's no 40 second break between pitches in baseball. No 40 second break. I don't give a @$% what they've done in MLB since 2000. There's No. Effing. 40. Second. Break." This.If they can sign him to a reasonable contract, do it, then trade one of the surplus of middle infielders for pitching.If he wants a longer term contract, pass, play Gordon, and spend the saved $$$ on pitching. Middle infield depth is a position of strength, use it wisely. I wonder how much the 'game of chicken' that's going on regarding the signing of free agents applies to Dozier?? Lots I think.If players start to panic and sign for less, it drives Dozier's price down. I find it fascinating to watch roster construction - youth or veterans?? Homegrown talent or maketrades or sign free agents?? Make a big splash now and 'go for it' or try to build for long-term sustained success? Trade your prospects before they fail or let them succeed (or fail) at the top level? Fascinating. Everybody has a different opinion but in the end it boils down to what Falvine decide to do. When I see a major piece of legislation being voted down because of a few swing votes that cited integrity, transparency, etc, as the reason only to see that same legislation passed a couple days later that somehow coincidentally had contracts(pork) for the swing voter's states added to the bill am I too skeptical to think the same of the player's union? I would welcome more than a generic "we voted it down to protect the integrity of the game". What is it exactly that compromises the integrity of the game?How about some details that a reasonable person would agree with. Why did I immediately think "Reasonable request turned down, not because of the substance of the request but because it could be used for negotiating or political purposes. "Took me very little time to find an article supporting that thought. This also supports Spycake's position that slow pace has been a recent issue rather than an issue throughout the history of the game. it also supports my memory that I didn't used to yell at the TV " throw the ball already!" or "get in the batter's box already!". Golf is also a game that has no natural clock and yet they have pace of play rules.As a result there was a penalty stroke assessed in 2017,one in 2013 (to an amateur at Augusta) and one in 1995.I can easily imagine that once the players get past their pettiness this rule would have no effect at all on the game except for quicker pace.Of course there are other possibilities for speeding up play but this is a no brainer. Sign Dozier, trade Sano for pitching. Move Dozier to 3rd when need be. Plus you still have Escobar to fill gaps. They tried to enforce the batter staying in the box rule for about a week. Then gave up on it. They've shortened up the break between innings a little and that helped, but the way bullpens are used now and the need for ad revenue are going to make the game longer than it was in the 20s. Tough to do much about those issues, but an easy target is the mound visits. Keep the hitters in the box and the catchers behind the plate and see where that gets us. If we still can't shorten the games then let's change some rules. I suppose you could argue that we are already at that point. How bout each team that wins a game in under 2hrs 45min gets a bonus? As for Dozier's pace of game comments, the player's union has demonstrated clearly that they know the desire of the league to speed up games, and that they are apparently not willing or capable to do what it takes to make it happen on their own. I assure you, I am "settled down", the strong language came from the poster I was quoting. The current rule is 12 seconds between pitches, with no one on base. Time between pitches is the primary villain. I tallied up all the pitches in both games that we’ll call inaction pitches — pitches that resulted in a ball, called strike, or swinging strike, but didn’t result in the end of an at-bat or the advancement of a runner. These are the pitches where the catcher caught the ball and threw it back to the pitcher, whose next step was to throw it back to the catcher. Foul balls didn’t count. The fourth ball of a plate appearance didn’t count. Stolen bases didn’t count. Wild pitches didn’t count. Just the pitches where contact wasn’t made, and the pitcher received a return throw from the catcher. There were 146 inaction pitches in the 1984 game. There were 144 of these pitches in the 2014 game. The total time for the inaction pitches in 1984 — the elapsed time between a pitcher releasing one pitch and his release of the next pitch — was 32 minutes and 47 seconds. The total time for inaction pitches in 2014 was 57 minutes and 41 seconds. This is how a game can have an almost identical number of pitches thrown, batters faced, baserunners, hits, walks, strikeouts, and runs scored compared to another game, yet take more than a half-hour longer. An extra 10 seconds between every pitch really adds up. I really do think that MLB is beginning to lose their younger fans.I work in a high school and talk to my kids about sports among other things, and there are just not many baseball fans.Could be the area that I am in (Syracuse), but our district has five high schools and only one baseball team.Little leagues are still somewhat popular, but I do feel that the sport needs to adapt a little.I think a pitch clock could be effective, but it doesn't seem to be the main aspect that is hindering popularity of the sport.I go to many minor league baseball games a year, and have not really noticed the game being any quicker due to the pitch clock.I actually really like the clock between innings.I think limiting the amount of times a catcher can visit the mound will help.Perhaps even restricting the amount of times a pitcher can step off the mound or a batter can call for time; this probably wouldn't work for obvious reasons, I am just trying to think where time can be saved.Maybe they look at the umpires and expand the zone to get outs "faster" and make the batters swing the bat.When I watch a game, I don't necessarily feel like it's the game that is slow, more so that the pitchers aren't that good (not throwing strikes, walking guys, giving up hits/runs, etc...) and causing the mound visits and pitching changes that actually do extend the time. As far as Dozier goes, I think giving him a 4-5 year extension is a mistake regardless of money.Where is he going to play in two years?I don't think he has the arm for third nor the reaction time needed.Realistically his next position is as a first baseman and that seems to be the place most suited for Sano if they keep him that long.I know Dozier is a solid player and 30+ home runs and positive leadership are difficult to replace, but sometimes a guy gets squeezed out.Difficult decision to make.I play OOTP baseball on a yearly basis and my team has never really been worse for not signing Dozier to an extension; I also know that a video game doesn't equate real life. Why after all these years does the game have to hurry up?Maybe just shorten the game to 7 innings like high school. I've seen this a few times in the past few months the idea of moving Dozier to 3rd.Isn't his arm why he didn't stick at short? His arm would play much better at 1st base than at 3rd base. I agree 100% here. I would much rather pay Dozier $16-$14 million per year and a TCV of $60 million. Then we can trade some of the extra "wealth" that we have in the infield that is talked about. Gordon + Granite + Hughes for Archer or controllable SP prospects. Granite deserves a shot at a starting job and should have some trade value, Gordon is expendable with Lewis, Polanco, and others in the system, and Hughes would allow for some salary relief while giving someone like TB a back end starter that could potentially contribute and provide innings. If we need to add one of our Relief Pitchers from AAA, then maybe that make sense too. Even as Dozier starts to decline in his older age, he will still be younger at the end of his contract then Ian Kinsler is today. Kinsler is still regarded by many as a above average 2B in the league. If Dozier was mad last year, and they don't sign a big time FA SP, I see very little chance of him wanting to stay. I could actually see him asking for a trade, if the FO and ownership don't acquire pitching. I know if I was him, I'd want to move on in that case. As for the Twins, IMO, they can more easily replace Dozier than they can find/develop starting pitching. I'd probably let him walk, depending on his price, and what budget I have to work with. → Article: Dozier Debate: Contract Extension? Pace of Play?